​Myanmar and China's CITIC Group on Thursday signed a framework agreement on the Kyauk Phyu Special Economic Zone (SEZ) Deep-Sea Port Project. 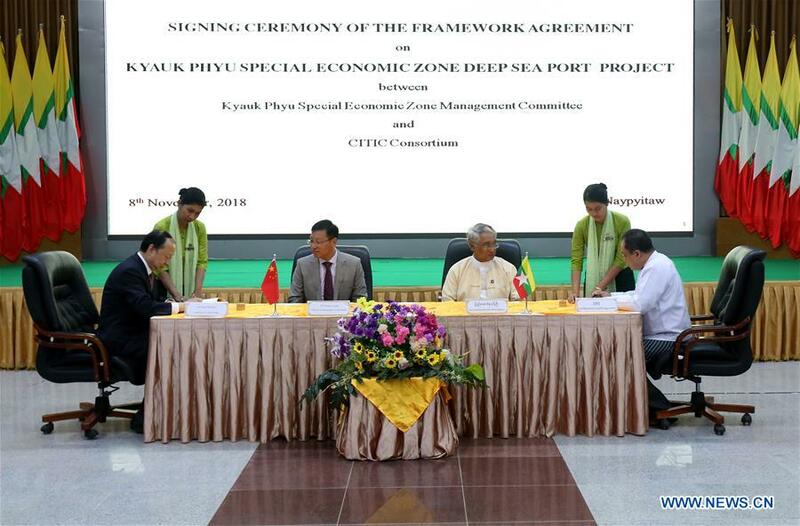 Myanmar and China's CITIC Group on Thursday signed a framework agreement on the Kyauk Phyu Special Economic Zone (SEZ) Deep-Sea Port Project. The framework agreement was signed by Myanmar's Deputy Minister of Planning and Finance and Chairperson of the Management Committee of the Kyaukphyu SEZ U Set Aung and President of CITIC Group Chang Zhenming. Chinese Ambassador to Myanmar Hong Liang, who witnessed the signing ceremony, said the Kyauk Phyu SEZ is important for Myanmar's economic development and its stabilization. The Kyauk Phyu SEZ is part of the China-Myanmar Economic Corridor, and the project will benefit the people of Myanmar and promote the China-Myanmar paukphaw (fraternal) friendship, said the Chinese ambassador. For his part, U Set Aung, who also attended the signing ceremony, said the deep-sea port project is an important project in regional connectivity.